A valid license is required to use the software. A limited demo is available for evaluation purposes and limited use. Your financial support ensures that we can continue to make improvements and offer new products in the future. This software must not be used to copy unauthorized music. Care should be taken so that you do not allow unauthorized users to download songs that are copyrighted. The terms of agreement for using this software is that you are responsible for not illegally copying music. You further agree to hold the developers harmless and defend the developers against any action against you as a result of using this application. A sincere thank you go to the following who have contributed code and art for this application. Jose for technical support, project management, docs, and MacWorld, and much more. RSSOwl Team - www.rss.org. We used your framework as a springboard for development. A number of resources were used, including the "Shops", I18n, Dialogs, and preferences. Dan Lewis for web and UI design & icons, trade show artwork, flyers, etc. iPhone access - Michael Heins and SharePodLib. A huge thank you to people who have submitted bug reports. Unbelievable how many little gotcha's can arise working with the millions of media files created by various operating systems and software! Keep it up and we'll keep working to make SuperSync the best product of its kind. This software uses code developed under the various licenses. 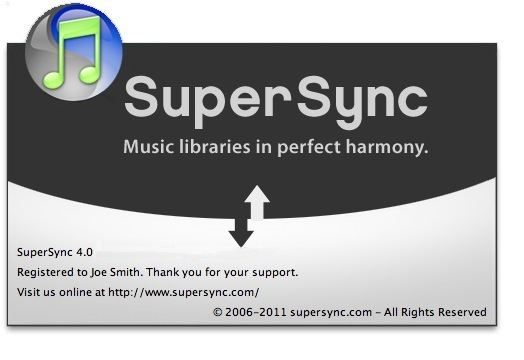 SuperSync was written in Java, C, C++, COM/AppleScript. It uses some stand-alone libraries that are licensed by various means. jpot - iPod importing code Copyright (c) 2005 Thomas Binder (tbinder@math.tu-berlin.de). All rights reserved. Flash Audio Player, written by Arun. Source available for license. Flash Video Player, licensed for use by supersync. Copyright Hitasoft.com All Rights Reserved. The full text of the LGPL license is available online at (http://www.gnu.org/licenses/lgpl.html). UNDER NO CIRCUMSTANCES AND UNDER NO LEGAL THEORY, TORT, CONTRACT, OR OTHERWISE, SHALL LICENSOR OR ITS SUPPLIER(S) OR RESELLERS BE LIABLE TO YOU OR ANY OTHER PERSON FOR ANY INDIRECT, SPECIAL, INCIDENTAL, OR CONSEQUENTIAL DAMAGES OF ANY CHARACTER INCLUDING, WITHOUT LIMITATION, DAMAGES FOR LOSS OF GOODWILL, WORK STOPPAGE, COMPUTER FAILURE OR MALFUNCTION, OR ANY AND ALL OTHER COMMERCIAL DAMAGES OR LOSSES. IN NO EVENT WILL LICENSOR BE LIABLE FOR ANY DAMAGES IN EXCESS OF THE AMOUNT RECEIVED FROM YOU FOR A LICENSE TO THE SOFTWARE, EVEN IF LICENSOR SHALL HAVE BEEN INFORMED OF THE POSSIBILITY OF SUCH DAMAGES, OR FOR ANY CLAIM BY ANY OTHER PARTY. We guarantee that the product performs as advertised for a minimum of 30 days. Users may claim a refund with cause for up to 30 days. Due to the nature of the software, changes in 3rd-party applications or operating systems may cause the PROGRAM to stop functioning as intended. In the case where a 3rd-party application or OS stops working with the product, we will attempt to notify our users of the situation, but we cannot guarantee a fix. iTunes and iPod are trademarks of Apple Computer, Inc. and is in no way affiliated with SuperSync. Thank you to all who have provided feedback, purchased copies, and helped us promote SuperSync.